If you were hoping to buy tickets for the super fight, we're afraid they're all gone. A VERY LIMITED number of tickets for the richest fight in boxing history went on sale Thursday and sold out in under a minute. The Los Angeles Times reported that just 500 tickets in the 16,800 seat arena were made available to the general public. The tickets for the public were priced as high as $7,500 with the cheapest going for $1,500. They have since appeared on resale sites for as much as $141,000 (€129,000) according to the BBC. 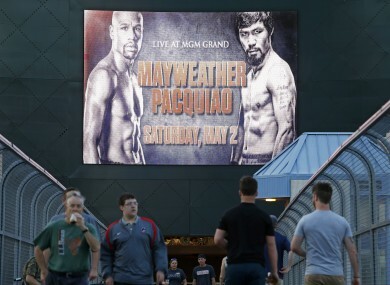 The release of fight night tickets comes just nine days before the May 2 fight after their distribution was held up for weeks because of a contract dispute between Pacquiao’s camp, Mayweather Promotions and the MGM Hotel. Meanwhile, it has also emerged that promoters of the fight have taken the unusual step of charging for the weigh-in after a limited number of tickets for the fight were snapped up almost immediately on Thursday. Tickets for the May 1 weigh-in, also at the Grand Garden Arena inside the MGM Hotel in Las Vegas, will go on sale today and cost $10 each. “The weigh-in is always the grand finale of fight week activities.” said Leonard Ellerbe, chief executive of Mayweather Promotions. Pacquiao’s promoter Bob Arum said Thursday the money from the sale of weigh-in tickets will to charity. “The charge of $10 for the weigh-in will benefit two great charities. All proceeds will go right to them. This is a win-win situation for all,” said Arum. Under Nevada law, weigh-ins are supposed to be free to the public. But promoters are hoping that by charging $10 they will discourage thousands of boxing fans from camping out overnight at the MGM to try and snag a ticket. Mayweather against Pacquiao is the biggest boxing spectacle in recent memory and it will go a long way towards determining who is the greatest fighter of their era. Both fighters are expected to make well over $100 million from the welterweight unification bout with 60 percent of the purse going to Mayweather and Pacquiao collecting the other 40 percent. Who WOULDN’T want to watch an MMA bout between two medieval knights? Email “Tickets for Mayweather v Pacquiao sell out instantly, now going for up to €129,000”. Feedback on “Tickets for Mayweather v Pacquiao sell out instantly, now going for up to €129,000”.